Patty Ferguson-Bohnee, director of the Indian Legal Clinic, has been asked to testify on “Fixing the Federal Acknowledgment Process” before the U.S. Senate Committee on Indian Affairs on Wednesday, Nov. 4. Ferguson-Bohnee has substantial experience in Indian law, election law and policy matters, voting rights, and status clarification of tribes. 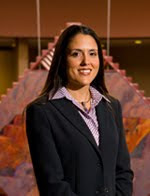 She has testified before the U.S. Senate Committee on Indian Affairs and the Louisiana State Legislature regarding tribal recognition, and has successfully assisted four Louisiana tribes in obtaining state recognition. She has represented tribal clients in administrative, state, federal, and tribal courts, as well as before state and local governing bodies and proposed revisions to the Real Estate Disclosure Reports to include tribal provisions. She has assisted in complex voting rights litigation on behalf of tribes, and she has drafted state legislative and congressional testimony on behalf of tribes with respect to voting rights’ issues. Before joining the College in 2008, Ferguson-Bohnee clerked for Judge Betty Binns Fletcher of the 9th U.S. Circuit Court of Appeals and was an associate in the Indian Law and Tribal Relations Practice Group at Sacks Tierney P.A. in Phoenix. As a Fulbright Scholar to France, she researched French colonial relations with Louisiana Indians in the 17th and 18th centuries. Ferguson-Bohnee, a member of the Pointe-au-Chien Indian tribe, serves as the Native Vote Election Protection Coordinator for the State of Arizona. This entry was posted in Indian Legal Clinic, Professors by Indian Legal Program. Bookmark the permalink.